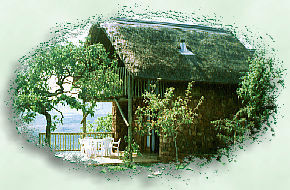 Benlize offers an intimate thatch cottage for two, a stone thatch seven plus an eight sleeper. This country retreat lies hidden amongst trees in the bushveld with a magical view overlooking Pecanwood, the Jack Nicklaus Golf Course and Hartbeespoort Dam.Our cottages are self-catering, fully equipped with TV, CD player, microwave and a private patio / braai area. The seven sleeper cottage has a cosy log fireplace for those chilly nights. Come and enjoy birdwatching, strolling in the bushveld, swimming or a game of tennis while relaxing in one of our luxury cottages. Our spacious, thatched lapa by the pool area which accommodates up to 20 guests, has a fully equipped bush kitchen and bathroom facilities, is available exclusively to our guests or by special arrangement. For the golf enthusiast, there are four golf courses in very close proximity and the Sun City golf courses are just 1 hour 15 minutes drive away from Benlize. Wanting a Midweek Breakaway or Planning a Midweek Four Ball? Call Us, We Offer 25% discount on accommodation Mondays to Thursdays.